Do you feel annoying with the app updates popping up frequently on your Android smartphone? There is a simple solution for this; Google Play Store has given the option of auto updating the apps without having to do manually every time without any interaction from you. Below are the easy ways to set the apps on your device to auto-update. 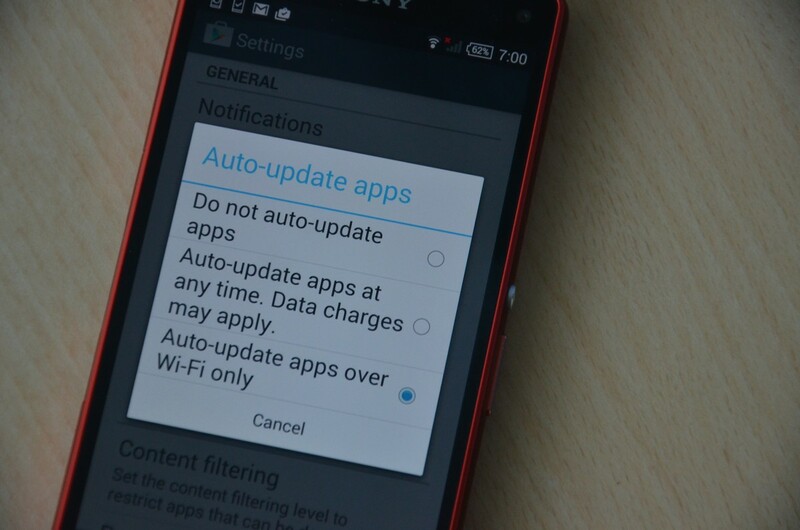 The Do not auto-update apps option will completely turn off the auto-updates and you will be receiving a notification whenever there is an update available. Auto-update apps at any time option will auto-update the apps with your permission, whenever there is an update available. This happens whenever there is internet connection, be it on Wi-Fi or on cellular data. The Auto-update apps over Wifi only option will update the apps only when the device is connected to a Wi-Fi network and do not use your cellular data. I would rather prefer using the Auto-update apps over Wi-Fi only option because, the apps will be updated where ever the device connects with Wi-Fi and moreover its saves lot of the cellular data and we don’t have to worry about high data bills. Note – If you are enabling the automatic updates, you won’t be able to accept the permissions of all the updates, only if they are included in a permission group that has been already accepted. And these app needs access to additional permission and you need to accept them manually even if you are on the auto-update mode. You also have the option of updating one particular app that you want to use it on cellular data if you are on Auto-update apps over Wifi only. You just need to go to that particular app and manually update the app. So this is a simple way to get rid of those annoying updates every time. And make sure you wont be able to read the changelogs if you are auto updating.